Design is in the Details . . . Limitations on the amount of photographs we can put on the MLS prevent us real estate folks from really showing the quality materials, details, hardware, and more in a house. Fortunately, I have plenty of space here to get into some of the finer points in the Phibbs House. Scroll down and take a look! South-facing wall of glass . . . This wall of glass is a great example of the elegance of mid-century modern design that is lacking in today’s architecture. Look at how the glass is installed so that the roof plane is not interrupted by the glass wall. The exposed beams are actually steel beams boxed-out with painted wood. Notice how far the roof plane extends beyond the windows. At roughly 8 feet, the extreme depth keeps the sun entirely out of the home’s interior during the hot summer months. Three main materials . . .
Walnut, maple, and natural slate set the tone for the interior design of the house. Notice the curved transition between slate and maple where the kitchen transitions to the living room. A vintage look . 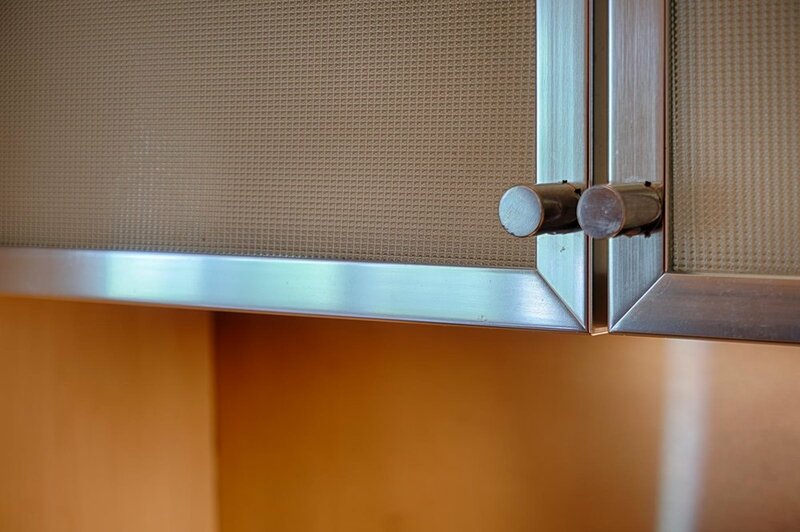 . .
With simple round pulls, aluminum frame, and architectural glass, this kitchen cabinet is both retro and sophisticated. Contemporary pulls . . . 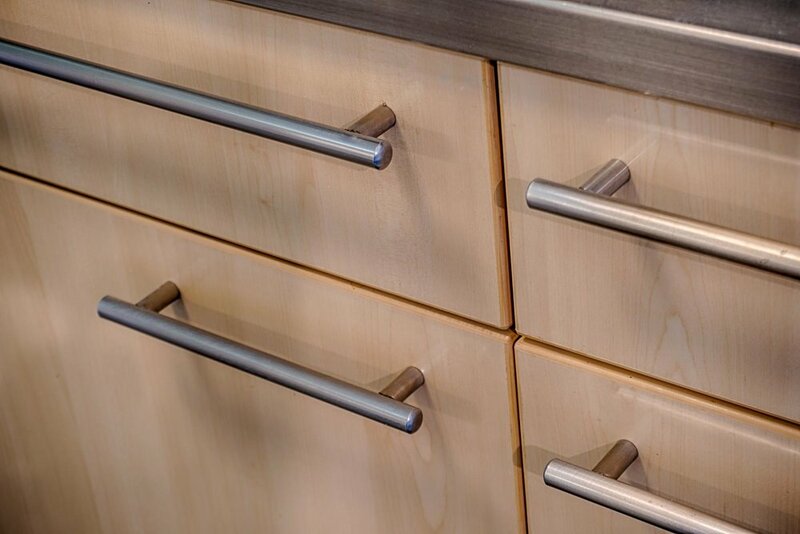 Contemporary pulls are used throughout the house, in this case, the kitchen features stainless steel (complimenting the stainless steel countertops) on the wood European-style cabinets. Natural slate flooring . . .
Natural slate flooring is found in many places through the house, and adds a variety of color, contrast, and texture to each room in which it is used. Granite meets fabric wall covering . . . 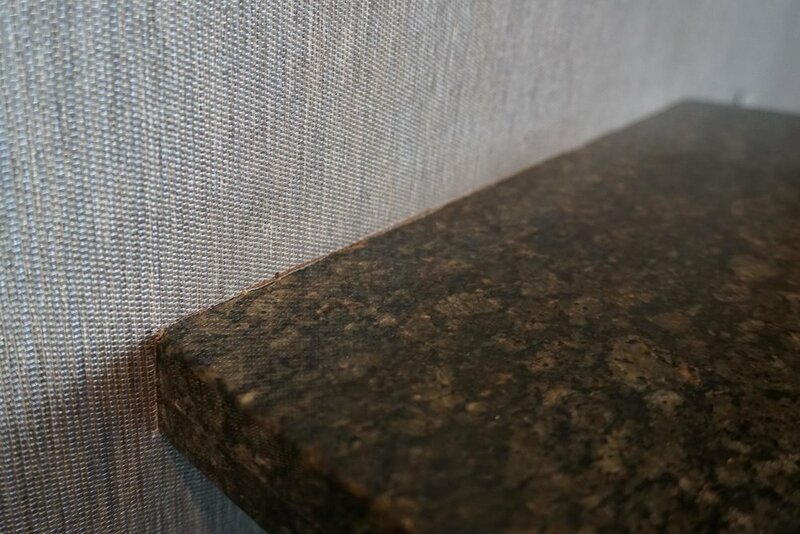 Granite meets the texture of fabric wall covering at the kitchen bar-top. Pendant light fixtures . . . Unique pendant light fixtures accent the kitchen bar top and compliment the chandelier over the front door. A unique glass chandelier . . .
A unique glass chandelier provides a unique and welcoming centerpiece at the home’s entry, and can be enjoyed both inside the house and from the street. Modern chandelier . . .
A ring of light above the dining room table in your glass dining room. Phibbs believed that the dining room was one of the most important rooms in a house, which is why it is placed in such a prominent location in the plan. Brushed stainless door levers . . .
High quality door levers compliment the brushed stainless steel cabinet pulls, stair railings, and other elements around the house. Custom wood trim . 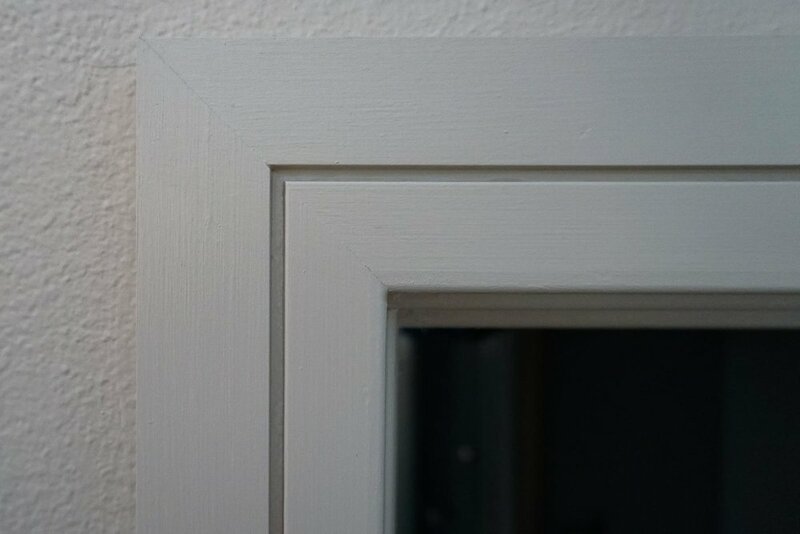 . .
Wood trim on every door frame features a simple reveal in the middle of the trim piece. Wall-mounted faucet . . .
Water cascades from a wall-mounted faucet into a clear glass vessel sink in the main level bathroom. Main bathroom tile . . . The bathroom on the main level features tile with a textured appearance and a unique vertical pattern. Bathroom pendant light . . .
High ceilings in the main level bathroom are accented with a simple pendant globe mounted over the sink. Travertine countertop . . . The luxurious ensuite master bath features beautiful travertine stone countertops and dual sinks. Fluted frosted glass pendants . . . Simple fluted glass pendant lights provide the vanity lighting in the luxurious ensuite master bathroom. Pocket doors . . . Sliding pocket doors are used in the ensuite master bath to save space, and feature brushed stainless steel cup pulls. Slate mosaic tile . . . Elegant mosaic tile of natural slate is used in the showers of both main level bathrooms. Large vitreous china sink . . .
Large, yet shallow, and with brushed nickel fixtures, this sink is one of many luxurious components of the lower level bathroom. Glass mosaic tile . . . The walls of the lower level tub/shower feature vertically oriented glass mosaic tile. Mailbox and address numbers . . . Visitors and the mail carrier are greeting by a dry-stack stone pillar that houses a stainless steel mailbox and glass address numbers that are backlit at night.